Eternal Orthodox Church calendar for the 07.11 year 2017. These saints were clergy with Patriarch Paul of Constantinople in the time of the Emperor Constantius. After the death of the great Emperor Constantine, the Arian heresy, which had till then been kept under, sprang up again and began to spread, and the Emperor Constantius himself inclined towards it. There were two influential nobles at the imperial court, Eusebius and Philip, both ardent Arians. 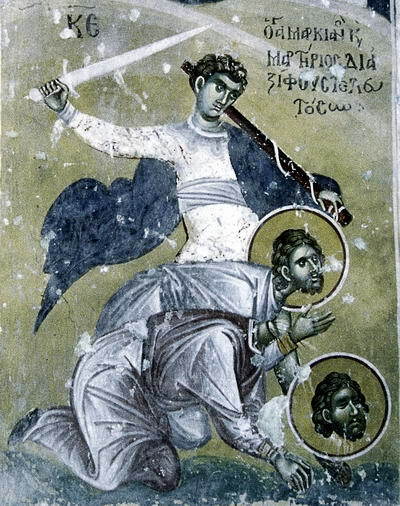 Through their influence, Patriarch Paul was dethroned and driven out to Armenia, where the Arians strangled him, and the patriarchal throne was seized by the dishonourable Macedonius. 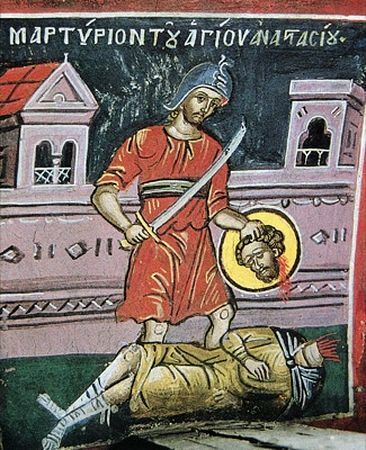 At that time, when Orthodoxy had two fierce struggles on hand, against both the pagans and the heretics, Marcian and Martyrius ranged themselves decisively and with all their strength on the side of Orthodoxy. Marcian was a reader and Martyrius a sub-deacon at the Cathedral, and had been secretaries to Patriarch Paul. The Arians first tried to bribe them, but, when the two holy men refused this with scorn, the heretics condemned them to death. When they were led to the scaffold, they raised their hands and prayed to God, thanking Him that they were finishing their lives as martyrs: "Lord, we rejoice that we are leaving this world by such a death. Make us worthy to be partakers of eternal life, O Thou our Life!" They then laid their heads under the sword and were beheaded, in 355. A church was later built to them over their relics by St John Chrysostom. He was a maker of cloth and a zealous Christian. In the time of Diocletian"s persecution of Christians at the beginning of the fourth century, this godly man went and presented himself to the judge of the Dalmatian town of Solin and confessed his faith in Christ. He was inhumanly tortured and then killed, and his body was thrown into the sea, from which it was later taken out and given burial. Tabitha (which means `doe") was a disciple of the apostles and lived in Joppa, the present Jaffa. 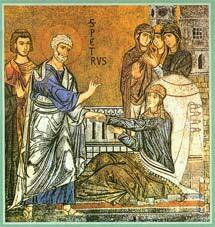 She was "full of good works and almsgiving" (Acts 9:36). She suddenly weakened and died at the time that the Apostle Peter was in the city of Lydda, and the grieving disciples sent to Peter, asking him to come and comfort his people. The great Apostle of Christ, on his arrival, told everyone to leave the room where the corpse lay, then knelt in prayer. When he had done praying, he called to the dead body: "Tabitha, arise! ", and Tabitha opened her eyes and arose. Drawn by this wonder, many came to faith in Christ the Lord.